The compact ART USB Mix is a 3-channel mixer and USB audio interface, ideal for home or mobile studios. The mixer has an XLR-1/4" combo jack input that can support mic, instrument, or line signals, allowing you to connect your favorite microphone or instrument. The input supplies condenser mics with 48V phantom power. There is also a a pair of 1/4" TRS inputs for stereo or mono line-level sources, ideal for connecting CD players, MP3 players, tape decks, and similar devices. The built-in audio interface converts analog input signals into digital signals that can be sent to your computer via the USB port for recording and editing your songs. Independent gain and level controls are provided for each input, the main output, and the headphone output. For added versatility, the USB playback switch enables you to monitor the output of your computer through channels 2 and 3. When used with a computer, the USB Mix is powered via the USB bus. As a standalone, the unit is powered with the included AC adapter. The Audacity recording software is also included so you can get started recording on your computer right away. 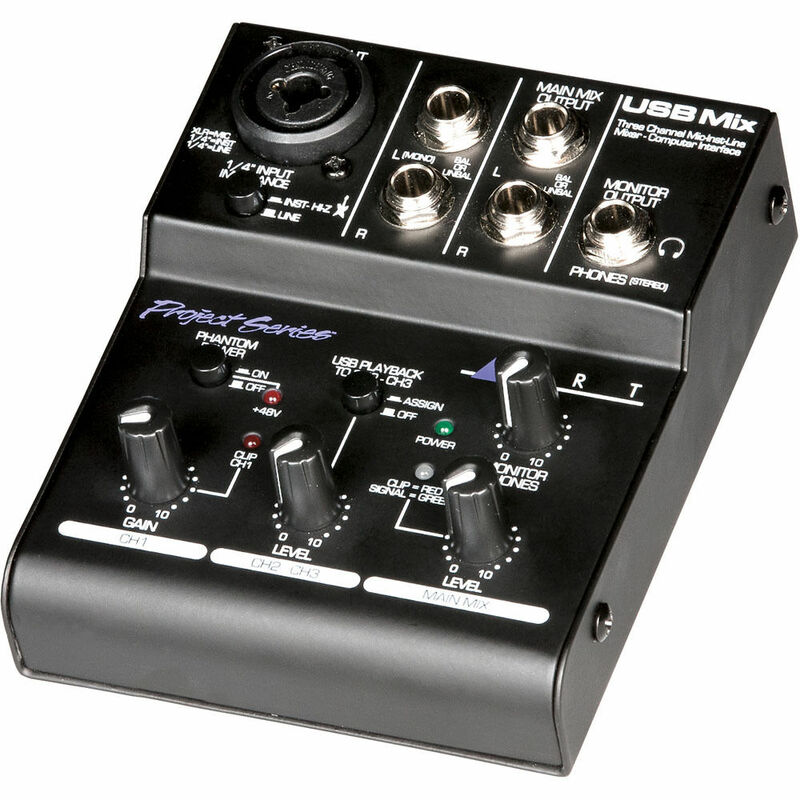 Box Dimensions (LxWxH) 9.25 x 6.1 x 3.6"
USB Mix 3-Channel Mixer and USB Audio Interface is rated 4.1 out of 5 by 7. Rated 3 out of 5 by Billiard The Button Pusher from Good Basic Mixer but Poor USB Interface Unfortunately this did not fit the bill for me, the USB interface only supports 2 channel recording. So while it was possible to record on all 3 channels at once, it only sends a 2 channel mix to the USB, therefore it is not posible to actually record all 3 of them as seperate channels. This was unacceptable for my needs as I needed separate microphone and stereo line inputs. The drivers are poor for professional recording, third party software such as ASIO4ALL needed to be installed to use it as an ASIO interface. Only 16 bit recording and 44100Hz or 48000Hz sample rates; but 48000Hz was problematic at times. USB interface aside, this works well as a basic small mixer and is quite well built. Rated 5 out of 5 by RTS from Quality at a bargain price! Quality hardware, full metal case and connectors. POTs have a good consistent feel. I was already familiar with Audacity so this was another plus. My WIN7Pro laptop detected it and installation was a breeze. Rated 2 out of 5 by Dani from Great while it worked Quality is amazing. It feels solid. Knobs are as smooth as they get. 35 days after purchase the right speaker stopped working. I need to fiddle with random buttons till speaker turns on. Very weird. Rated 4 out of 5 by Med X from The right mixer for the job I recently did a webcast and needed to take a line feed from the mixer and attach it to an audio stream being generated with an application on my laptop. This mixer gave me the control I needed to ensure good sound quality. The one thing that isn't so great about it is that you can't easily reconfigure your systems sound devices once the mixer is disconnected. Rated 5 out of 5 by Adam P from Great interface. I bought this interface to use with my laptop for recording my vocals. I did a quick test and everything worked great and sounded great. Highly recommend this mini interface for recording a single instrument or vocals. It's easy to setup as well and the driver installs instantly on windows 7 and windows 10. Includes phantom power. Rated 5 out of 5 by Darin the Technician from Simple and Easy to Use Great product in a nice metal case. Perfect for mixing a microphone and a line level (stereo) input. Rated 5 out of 5 by Bobby from Perfect solution for our Internet stream! This mixer is a great value and performs perfectly as an audio interface for our Internet stream. Getting static and interference noise. When I unplug USB it stops? A comprehensive test of every device in your setup would need to be done to determine where the interference noise and static is coming from. You could be getting RFI (Radio Frequency Interference) through the computer or computer monitor. If the noise is a ground loop, you may try the EBTECH HUMX which filters out unwanted voltage and current in the ground line that cause ground loop hum, while simultaneously maintaining a solid, safe ground. Is it possible to use this product as an external sound card? Specifically, I'd like to use it to connect it to my computer through USB and use it to get sound from my computer to my studio monitors. Is this possible? You can use it as an external sound card, but you need a lot of gain reinforcement to get decent output levels. I had to get an active DI box to get the output signal up to pro levels. That set me back another $40. The ART USB Dual Pre has the same issue. ART just doesn't like making its USB interfaces too loud, it seems.ART markets the USB Mix as if it could be used as a standalone mixer, like Behringer's Xenyx 302USB. But, IMO, that isn't true. the 302USB is a LOT louder than the ART unit. It isn't even contest. It's worth mentioning, I think, that ART's ASIO driver works on both mixers.